Hosted By Tammie’s Reviews, Giveaways and More, Queen of Reviews, A Medics World, PaulaMS’ Giveaways, Reviews & Freebies, One Sassy Geek and Michigan Saving and More. Thinking about the cleanliness of your home? We have a giveaway for you to win a Steam Machine! The HomeRight Steam Machine Plus is the go to product for chemical free cleaning in your home, office or just about anywhere that you want. 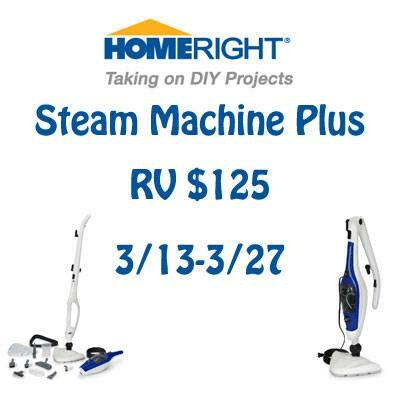 The SteamMachine Plus Multi-Purpose Steam Mop from HomeRight is ideal for quick, daily, chemical-free cleaning. This multi-purpose steam mop heats up quickly and is great for quick daily floor cleaning. The SteamMachine Plus features a detachable hand-held steamer. The included 6 attachments are ideal for cleaning and disinfecting stovetops, ovens, grills, countertops and bathrooms. The 205 degree temperature steam at nozzle kills 99.9 percent of germs and bacteria including e-coli, salmonella, and staph. The handle folds down for easy storage and also features on-demand steam trigger on handle, plus a cord wrap on the handle. The floor mop and pad features a swivel triangular mop head for added maneuverability. Use the SteamMachine Plus to disinfect your hard floor surfaces; such as laminate, hardwood, tile, stone, vinyl and linoleum. Winner will be notified by email and have 24 hours to respond or another will be chosen. [email protected] is the email it will come from. Disclosure- Work Money Fun was not compensated either by free product or payment. I have not been compensated for this post. All opinions and experiences are my own. Open to the US, must be 18+. Confirmed Winner(s) will be contacted by email and have 24 hours to respond before a new winner will be drawn. No purchase necessary. Void where prohibited by law. Entrants must only enter with either one email address, IP address and/or Facebook account, anyone found violating these rules will be disqualified. It is at the sole discretion of the admin of the giveaway if the winner has met the rules or not. The sponsor(s) will be responsible for product shipment to winner(s) of the giveaway. Sponsor will be responsible for prize fulfillment. This event is in no way associated with, sponsored, administered, or endorsed by Facebook, Twitter, Google, Pinterest or any other social media network. The disclosure is done in accordance with the Federal Trade Commission 10 CFR, Part 255 Guides Concerning the use of Endorsements and Testimonials in Advertising. For questions about this giveaway or to have me promote your product, Please email Tammie at [email protected]. I just have a broom and a mop, this would be so helpful. White vinegar is my favorite cleaning product, of course! It’s a natural cleaner. I apply it to spills on carpets because it doesn’t harm the fibers. It also works well on laminate floors, wood, tile, and vinyl. I really like those magic erasers, they’re good for cleaning a lot of surfaces. My favorite is my robot vacuum cleaner. It is great for all rooms. I have a Shark Navigator vacuum and it is awesome.We have pets and live in a sandy area and it doesn’t miss a beat. It would be my steam mop! Cleans unbelievably well! I have a broom, a vacuum and my hands. I dont have any special cleaning tools. A steam mop would be great for disinfecting everything though! Vinegar. a rag and some good old elbow grease are my go to tools for cleaning up most cat messes and spills. I have really been wanting a steam cleaner! My vacuum is probably my favorite go=to cleaning tool—the house just feels better freshly vacuumed. I think a steam cleaner would make the other floors feel fresh, too. Mt broom and mop for the kitchen and bathroom since they dogs & cats are usually in one of the 2 a lot of times! Mine is my hoover cause it picks up everything and leaves everything so clean. I love the magic erasers. They can clean almost anything, like the tub, fridge, sink and anything else. My go-to cleaning product is the Magic Eraser because it’s magic! And it cleans everything!!! I use a mop on my kitchen and bathroom floors now. It really works out good getting the floors clean. Mr. Clean Magic Erasers! They can get most everything up! My go to cleaning aid is my vacuum. I vacuum in almost every room even if there is no carpet….You just cannot get all the dust bunnies and dust webs with anything else. Apple cider vinnegar – I use it to clean everything! My go to cleaner is my swiffer spray cleaner and swiffer sweeper for pet hair. I am used to cleaning up stray cat litter that my cat kicks up when he is using the litterbox, so I usually just use a handvac to clean that up, but this would help too. I have a Shark steam mop that I use all the time. My go to cleaning appliance is my vacuum. I use it nearly every day. It seem like my family is always tracking stuff in or dropping food on the floor. I can hardly keep up. My go to is my vacuum…I have a 4 yr old that is a tornado! My main go to cleaner is bleach. There are so many uses for it. My go to cleaning appliance is my dust buster. I use it regularly to clean up spills and messes. Between my teenagers and my cats, I always seem to have a mop and bucket in my hand. I really should buy a steam machine. My Little Green Machine is a life saver — use this for dog messes, spills etc… Wouldn’t be without one. I have a whole house vacuum that is very powerful and this would be a nice complement for my hard floors. My go to cleaning tool is the Magic Eraser. I love these things. One of my go to cleaning tools is a steel wool pad–great for hard to clean pots and pans. Also great for other serious cleaning, like a big mess of sticky footprints on my basement stairs recently. I @Campswp6 love magic erasers. The Mr. Clean Magic Eraser is great for all kinds of dirt and grime. I love my Swiffer wet jet. It is so much easier to clean the floors that way. my only one is a vacuum cleaner, so that’s my go-to…other than that, it’s all manual labor. I am in the middle of organizing my basement–just taking a break–and realize how much I use my broom and dustpan with the long handle so I son[t have to bend over as much. Baking soda is my go to for stainless items & porcelain. I like soft scrub for all my sinks and tub. One favorite tool is the Magic Eraser. I once used to to clean black Sharpie marker from a white wall. The old fashion way…rags, mops and elbow grease. My go to cleaning appliance has got to be my vacuum. With pets, there is never a let up of fur! UGh! Thanks for the chance! I love my Swiffer duster for dusting furniture and ceiling fans. My go to cleaning product is my Swifter duster. I love it and it works better than dusting rags. Can’t live without my Kirby vacuum/rug cleaner system. And Magic Erasers (have young grandchildren living with me)! Can’t live without my Swiffer dusters. For some reason in Arizona, everything gets so dusty! Windex is my go to cleaning product. My go to cleaning item is my vacuum. A room always looks better when it’s vacuumed. I like my Shark vacuum. The most used cleaning device used in my house is the vacuum. I like the Magic eraser it get out the tough stains. I just use an old fashion mop with a bucket of soapy water. It gets the job done and I don’t know of anything that does a better job then that. I clean daily with Clorox Clean up & Pine Sol, I watched my mother use these products for years and always worked great, Thanks for the chance to win this great steam machine. One of my go to products is the Mr Clean Eraser. It works on almost anything. My go to cleaning appliance is the vacuum because our cats shed like crazy so we need to use the vacuum a couple of times per week to keep the house clean. I love magic erasers they really are magic. fabuloso is my go to cleaning product. we dilute it and use it for everything. My go-to cleaning appliance is my Bissell Pet Hair Eraser. I share my home with 2 dogs and 3 cats. Needless to say, the Bissell gets a workout on a daily basis. My go to cleaning product is Comet – cleans everything. My go to cleaning appliance is my vacuum. The cat can make such a mess! My 30 year old Hoover vacuum is still awesome. Picks up everything and the long haired cats shed like crazy so there is always fur on the carpet. I use my Swiffer a lot just for dust mopping, but this nice steam mop would work a lot better. Thanks for having this contest! My go to cleaning product is the blue Dawn dish soap! That stuff is so versatile I love it! The vacuum is my go-to appliance for cleaning the house because our cats shed everywhere.